The University must scrap the protest injunction and apologise for their handling of the events of 3 December 2014. 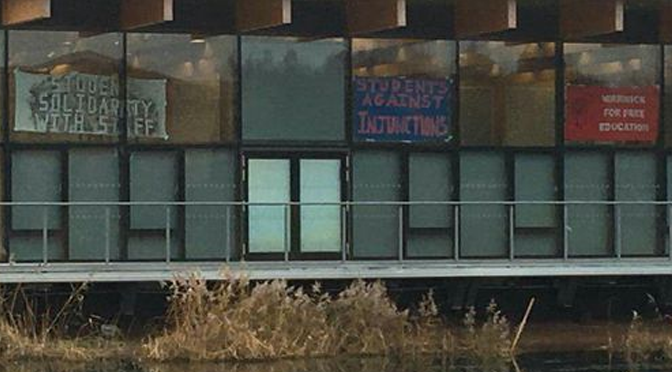 Opposition to the Higher Education and Research Bill is widespread at Warwick, amongst both staff and students. The occupation has already released a statement indicating that this is a direct act of solidarity with staff to fight the erosion to our working conditions that the TEF will entail. We therefore call on University management to promise no legal action under the injunction and reiterate our request that it be lifted with immediate effect. The tone of this letter, and its content, is very heartening. We hope that this spirit of teamwork and collegiality can continue so that all members of the University can work togther to protect our institution from damaging change.